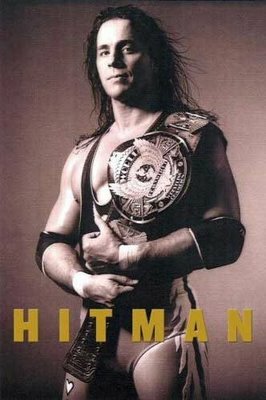 I received Bret “the Hitman” Hart’s autobiography as a Christmas present two years ago, and put it on my ever-growing reading list. Well, its turn finally came around and I’m glad it did – it’s a fascinating, although somewhat disturbing, read. Hart has had one of the most successful careers in professional wrestling history, starting in Calgary with his father’s Stampede Wrestling and rising through the ranks of the business to win the top titles in both the World Wrestling Federation and the rival World Championship Wrestling. His memoir is very family-centric, looking at his relationship with his parents Helen and Stu, his 11 siblings, their spouses and his wife Julie. He also discusses in great detail the end of his tenure in the WWF, when promoter Vince McMahon and some of Hart’s co-workers conspired to strip Hart of the World Championship belt before leaving for WCW. One of the last of the truly old school wrestlers, Hart always maintained the professional wrestling code of honour –kayfabe – that the fact that the matches are pre-determined never be revealed. When he was an active wrestler, he and his brother Owen did not speak to each other in public for years because in the storylines they were enemies. However, the Harts broke kayfabe for the filming of the documentary Wrestling with Shadows, which coincidentally covered the abrupt end of his career with the WWF. This event, known to wrestling fans as “the Montreal Screwjob” is the climax of the book’s third act, bringing to a head simmering professional and sibling rivalries that sink Hart into a deep depression. Ultimately, it leads to a life-changing stroke that paralyzes the athletically gifted Calgarian. Hart’s writing is striking not just because of the content, but also the tone. His family settles most of its squabbles through violence. His fellow wrestlers indulge in performance enhancing and recreational drugs at an alarming rate. Hart writes candidly about his many extra-marital affairs that wreck havoc on his already tempestuous marriage. Somehow, Hart has a nonchalant tone about the dysfunction that surrounds him throughout the book. Even then, Bret seems dowdy compared to some of his brothers like Smith, who has fathered countless children out of wedlock, or Dean, whose drug use exacerbates his Bright’s Disease, eventually leading to kidney failure. The tragic death of Owen, the youngest member of the Hart clan, is the final straw as the family implodes. The family becomes divided as various siblings turn on each other, trying to publicly embarrass their rivals or force them into bankruptcy. As the Hart’s are at war, Bret’s wrestling family also turns on him. In particular, Vince McMahon, Shawn Michaels and Hunter Hearst Helmsley align against him to oust him from his position as the face of the WWF. It’s an emotional, dark read that will shock the reader with its graphic descriptions of Hart’s lonely, violent and nomadic life as a professional wrestler. I’d recommend Bret Hart’s memoir to anyone, professional wrestling fan or not, for its candid look at what amounts to office politics as well as the tragic undoing of the Hart family. There are lessons to be learned from Hart’s life that go beyond how to take a chair to the head or how to make yourself bleed.